The Fab Four: Digital Scrapbooker Beginner!! 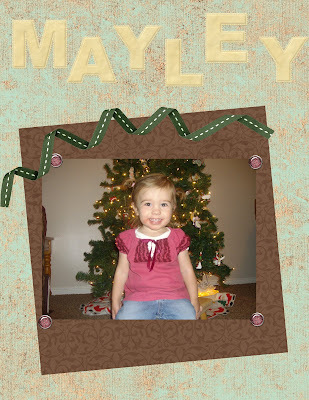 Ok So I'm not a pro yet but I got Bry photoshop for Christmas because he loves to take pictures. He's way good at photography actually and he's been wanting it forever!! I wanted it too so that I could learn the fun way to digital scrapbook :) Thanks to my sister Brittany and inspiriation by Leslie Golden Miller and my hubby I FINALLY figured it out! It's super fun!! I hope I can do it better on my next attempt! JEALOUS. You'll have to be my mentor one day when I get it. This is awesome Mookie. I've had this for a year now and I still can't figure out how to do pages. You are amazing! Good job. It is harder than it looks. You just needed to sit down, read and figure it out. Too hard to explain on the phone. Mayley is getting big! Love you!